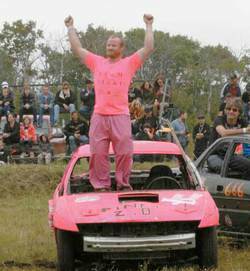 Team Pinky 2.0 won the "Best Dressed" category at the New Sarepta Demolition Derby. The sounds of crunching, twisting metal could be heard from quite a distance away but in the aftermath, thankfully, no emergency vehicles with their sirens blaring were needed for this multi-vehicle accident in New Sarepta. As a matter of fact over 1600 people were witness to it but no police reports were needed as the annual New Sarepta Demolition Derby crashed and bashed its way through another year to the sounds of happy shrieks and cheers. "This event began in 1970." said one of the organizers Dennis Levassuer, "We took it over in 2000 and it has continued to grow every year since then. This is definitely our biggest fundraiser of the year and it brings in usually between $8-9000.00 for our organizations." In a joint effort between the New Sarepta Minor Hockey Assoc. and the New Sarepta Agricultural Board, this event draws their audience, as well as cars and drivers, from several surrounding municipalities that look forward to the derby every year. This is a major fundraiser for the NSMHA and Ag Board with the bulk of the volunteers coming from, and most of the proceeds from the event going to, New Sarepta Minor Hockey. "It's a huge undertaking for such a tiny community," stated Dennis, "but New Sarepta is amazing in how they support this event. There are more than 70 volunteers needed to run this thing every year." In a hamlet of only 2000 people that is pretty impressive volunteer participation. And the groups see the Derby growing every year with spectators lining their cars up sometimes almost a 1/4 mile both directions down the main drag of New Sarepta waiting to get in the gate. And no one is disappointed once they arrive and claim their spot in the bleachers as the day begins with the "Best Dressed" car competition warming up the crowd as the winner is based on audience cheers. This year Team Pinky 2.0 took the trophy in his fluorescent pink t-shirt and matching vehicle! Then the mayhem began with the first full sized car class, then the ever popular minis had their moment in the sun, and finally the much anticipated truck class ended the day with a literal "bang"! "The most popular class of the day is definitely the truck round." shared Dennis. "It's amazing how much punishment those things can take and still keep moving!" Vehicles and drivers alike take a lot of punishment in this sport but thankfully this year there was no need of the services provided by the many EMT's, firemen and ambulances that were on location all day. Overall 45 vehicles entered the arena on this day but only a few made it out alive. For the vast majority the final ride to the junkyard in the sky was provided by a New Sarepta legend, the Big Green Cuke. This aged yet still hard working tractor has been a fixture at the New Sarepta Demolition Derby since before most people can remember. The Big Green Cuke gets almost as many cheers as some of the vehicles on derby day! Now the arena is once again silent with only some little chunks of colourful metal to be found to remind everyone of the action that took place in this little hamlet last weekend. But rest assured, this time next year the sound of multiple horrific car crashes, crunching metal and screaming people will once again resound in the area. But don't be afraid, come on down and join in the fun because the New Sarepta Demolition Derby will be back in town!